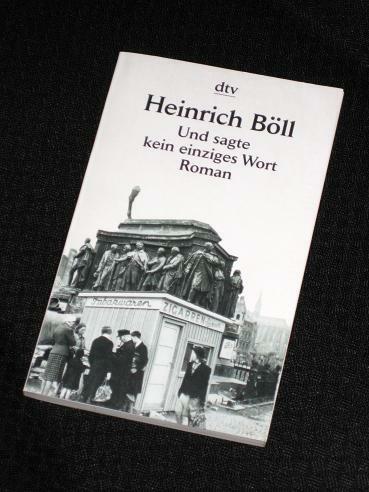 First up today is one of my favourite German authors, Heinrich Böll. He received his prize in 1972, but today’s offering, Und sagte kein einziges Wort (And Didn’t Say A Word), is one of his earlier offerings. Set in Cologne in 1950, the book relates two days in the lives of Fred and Käte, a married couple whose recent life together has actually been spent apart. Unable to cope with living in a cramped single room with three noisy children, Fred has moved out, sending Käte his pay packet each month and occasionally meeting up with her for clandestine dates. However, Käte has had enough of this demeaning existence, and the events of the weekend force the couple to face up to both their responsibilities and reality. Post-war blues among the poor is Böll’s speciality, and once again he portrays the plight of people going nowhere with a clear, sympathetic and, at times, ironic pen. He also continues in his attacks on the Catholic church, an organisation which he sees as putting the horse before the cart in its insistence on adherence to doctrine above brotherly love. By comparing the pomp and ceremony of the church with a procession of pharmacists in town for a convention (the neon signs imploring us to trust in our pharmacist are a particularly deft touch! ), Böll pokes fun at an organisation that is perhaps taking itself a bit too seriously. The book is divided into thirteen chapters written in the first person, alternating between Fred and Käte. The couple tell us in their own voices about the struggles they face, and it is perhaps more what they tell us about the other than about themselves that gives the reader an insight into their exhausting existence. With their contrasting ways of coping with the daily grind (Fred lives recklessly, unable to see the point of living; Käte takes each day as a battle, facing up to her enemies, whether they be landladies or dirt…), the question has to be asked: are they actually right for each other? The story, written in the late 1880s, is a beautiful piece of naturalism, its lengthy, elegant descriptions of the woods around Thiel’s work hut reminiscent of one of my favourite writers, Thomas Hardy. The tragic outcome of the tale only strengthens that connection, and in fact Hauptmann was greatly influenced by Hardy’s writing. Thiel could be a Hardy hero, tormented by someone whose presence should make his life more bearable, doomed to an unhappy life despite his able faculties and propensity for hard work. However, one could argue that it is all his own fault. The crushing blow he receives is directly related to his failure to face up to his moral dilemma. In shying away from his duties, he fails himself and his son… A sad story, but beautiful writing. read neither of these writers, although am aware of Boll, so thanks for the post. PS, How do you get the Umlaut to feature in the names etc, The only way I've managed in the past is copying. I loved every Böll I read, so this one was no exception. “Post-war blues among the poor” is very well said. I need to read this novella by Hauptmann (did you see there were other reviews? ), it sounds wonderful and I'm intrigued by the comparison to Hardy. I wasn't aware that Germany had so many Nobel Prizes. Do you have a particular Hardy work in mind – something with this hallucinatory use of nature? I barely know Hardy. P.S. Watch out next week for a special involving the G-Lit Month Tour Bus (I'll say no more!). Caroline – I've read about seven of Böll's books now, and they've all been varying degrees of wonderful 🙂 Hoping my copy of 'Der Engel schwieg' gets here in time for the readalong too! And yes, I did see Tom's review (and Vishy's?). Nice reviews, Tony! I read Hauptmann's 'Flagman Thiel' last week and liked it very much. It is a sad and poignant story. I didn't know that Käte in German had an umlaut! That is really interesting! Tony, thanks for stopping by my blog. I've just begun Böll's “The Lost Honor of Katharina Blum”, and it's great. Since this German thing started, I've already read two by Böll – K. Blum and The Silent Angel. I find he's a really worthwhile use of reading time.